In writing my recent elobeatlesforever (elobf) article: Reaping The Harvest regarding the multiple releases of ELO's Harvest singles "Roll Over Beethoven" (#HAR5063) and "Showdown" (#HAR5077) , Yours Truly KJS mentioned "Manhattan Rumble (49th Street Massacre)" the withdrawn 'B' side for "Roll Over Beethoven" replaced by "Queen Of The Hours". Yet , whereas "Manhattan Rumble" was possibly the most unlikely of ELO 'B' sides here in the UK, it was matched in the US by the even more unlikely selection of "The Battle Of Marston Moor (July 2nd 1644)" as the flip side of "10538 Overture" (UA #50914) while the amiable Roy Wood composition "First Movement (Jumping Biz)" was found on the 'B' side of ELO's debut single here in the UK. 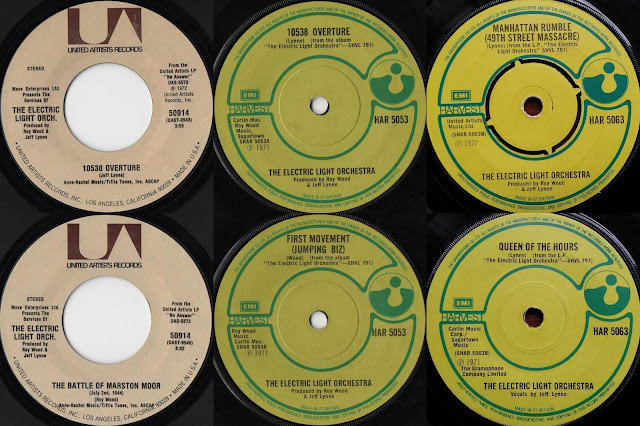 This means that five of the nine tracks from debut album "The Electric Light Orchestra" (or "No Answer" in the US due to a secretarial misunderstanding) were released in 7" format in the UK/US. This is especially surprising when you consider that tracks like "Whisper In The Night", "Look At Me Now" and "Mr. Radio" remain as album tracks to this day although a withdrawn 7" single edit of "Mr. Radio" can be found on the 2006 Harvest 3CD compilation "The Harvest Years: 1970-1973" (#SHDW414), suggesting that it may have initially intended as ELO's second single. "And - please - will you sit up and take notice this time. If you're a real ELO fan, there's a lot to be learned from this early stuff, you know ... It's for that very reason that you should listen attentively to these early works. Okay?"